Call it what you will, but I've decided to put one of my novels on Kindle. With so many others doing the same, I don't expect to make thousands - or even hundreds - of sales. What I do expect, however, is a sense of (and I know this sounds cringe-inducing) artistic satisfaction. It's just good to know that one of my books is out there, living, breathing, doing whatever it is that aggregations of words do when you leave them to get on with it. 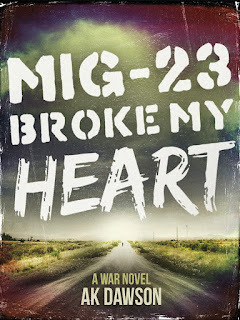 Set in Southern Africa in 1988, MiG-23 Broke my Heart is a war novel, a road story and a certain kind of romance. Thomas Green, eighteen years old and full of ambition to do nothing but smoke weed and draw pictures, has been called up by the South African Defence Force. It's his job to watch the hot, sandy border of South-West Africa (now Namibia) for signs of communist infiltrators from the north. To him, his two-year conscription is as good as a prison sentence. Life gets worse when a man approaches on foot from Angola, the place where the terrorists are said to come from. Hi, I read the sample pages and then bought tbe book. Your other post mentions the 86p price. I think for a first book that's good. At 86p if I even half like the sound of it I'll buy it. Hopefully it will sell well and book 2 can go on the market for more. I have read blogs about price where argument is over money. Sell less at a higher price and still make more - I don't buy that. In the early days it's about name. You could spam twitter or you could sell cheap. One way wins you friends. I've got a book backlog at the moment but I'm looking forward to reading this. Thanks for buying the book. Yeah, I think what I was saying in my 99c/86p post was that I'd rather be a writer than a businessperson. And I agree completely with your comment about spamming twitter or selling cheap - winning friends seems like the way to go!